Those Who Grow "The Green" Love Our Green-Dex™/N-DEX® Biodegradable Nitrile Gloves! Those Who Grow “The Green” Love Our Green-Dex™/N-DEX® Biodegradable Nitrile Gloves! For decades people debated whether or not marijuana should be or would ever be legalized. For those old enough, many can now say that day has arrived. Marijuana legalization is sweeping all over North America – 10+ states plus Washington, D.C., have all legalized recreational versions of cannabis over the last few years and in 2018 Canada past full legalization. It's shown that the majority of Americans now support marijuana legalization and with these historically high levels of public support for marijuana legalization, more states are legalizing through legislature. To meet consumer demand, cannabis processing facilities and dispensaries are popping up everywhere and if there's one PPE item that processors and growers really appreciate, it’s our line of biodegradable latex-free and powder-free disposable nitrile gloves! Worn in conjunction with disposable pocket-free lab coats, beard covers and bouffant hair caps, single-use type gloves such as nitrile gloves prevent cross contamination making them ideal hand protection for budtenders. Disposable gloves are commonly worn in grow facilities during cultivation, processing and plant inspections as a protective barrier against skin-to-plant contact which diminishes the potency of the product. Disposable gloves are worn in mass and are eventually tossed into landfills where it takes over 100 years to breakdown. For single-use glove users, there hasn't been a more sustainable option, that is ... until now! Our Nitrile Gloves are Certified Biodegradable & a Healthier Choice for Mother Earth! Crafted with SHOWA’s revolutionary patent-pending Eco Best Technology® (EBT), it is the breakthrough innovation that makes these GREEN-DEX™ and N-DEX® gloves fully biodegradable, sustainable and the first of their kind. These abilities have been validated by independent certified laboratories using SSTM international test methods (ASTM D5526 & ASTM D5511) which has confirmed that 20% of a GREEN-DEX™ and N-DEX® glove will have biodegraded in 160 days with full biodegradation within 1-5 years! 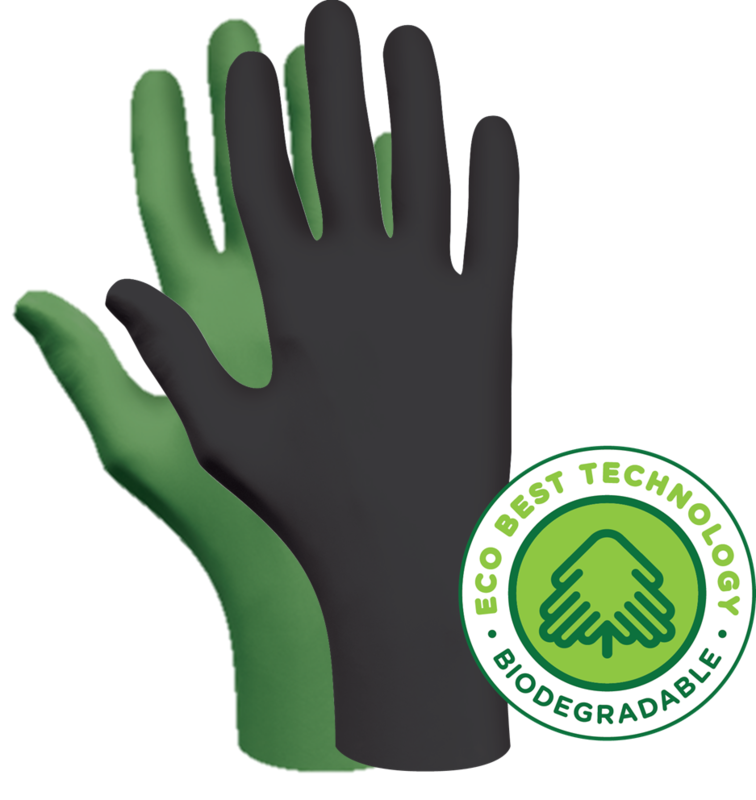 Available in popular green and black colors, our biodegradable disposable nitrile gloves deliver unmatched comfort, dexterity, strength and performs the same as standard non-EBT type disposable nitrile gloves. They are free of natural rubber latex proteins and decreases the risk of allergies. At 4-mil thick, they work with touchscreen devices and offer the perfect balance between tactility and strength. The packaging of these gloves are made from recycled paper and 100% post-consumer waste!